“Here in Africa we have plenty of sun. And it is free. Let’s take the women out of their smoky kitchens! Let’s save them money so they don’t have to buy fuel to cook or find wood! Let’s help them use the sun to cook and clean their water!” - the rallying call of Mama Solar! Faustine Odaba, or Mama Solar as she has been so aptly named, is the Sun Queen - teaching women all over Africa how to cook and pasteurize their water using simple solar technologies. She is the award-winning Founder and Director of Natural Resources and Waste Resource Alliance dedicated to promoting eco-friendly technologies. Her motto, “Waste No Waste” embodies the work she does by teaching grassroots women to pasteurize water and cook using the solar technology, conducting simple water tests using the Portable Microbiology Lab, and making bags, mats and other household products crocheted out of used plastic bags. Mama Solar has been one of GWWIs core trainers, having joined us at our Women and Water Training in 2008 in Kenya, 2010 in Ghana and again in Uganda 2011. We first met Mama Solar at the World Social Forum in Nairobi, Kenya in 2006. We were researching and laying the foundation for our first Women and Water Training and connecting with Wangari Maathai, the Green Belt Movement and GROOTS Kenya, who ultimately became our partners for our 2008 Training. Mama Solar’s bright smile and infectious spirit not to mention her delicious corn bread amongst the 100s of thousands of people, drew us into her tent where we discovered one of the most intriguing and simple technologies. She introduced us to the Solar CooKit as an affordable technology to using fuel and firewood for cooking and boiling water! Rachel and Grace were participants at Global Women’s Water Initiative Training program in 2011. 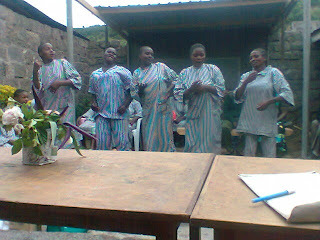 Both Rachel and Grace work in leadership roles at the Bukoba Women’s Water Empowerment Association (BUWEA) in Tanzania. BUWEAs ultimate goal is to create opportunities for women living in rural areas to increase their household income. 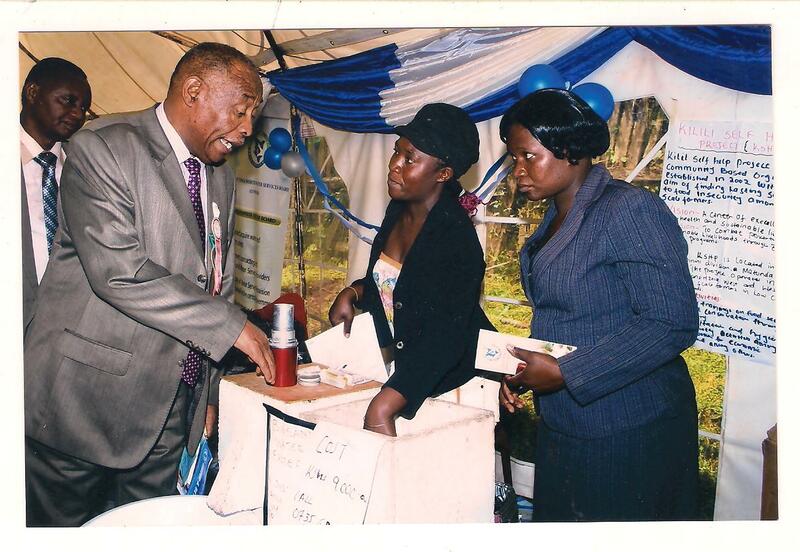 BUWEA has over 350 women members in 61 groups in 30 villages of Bukoba. 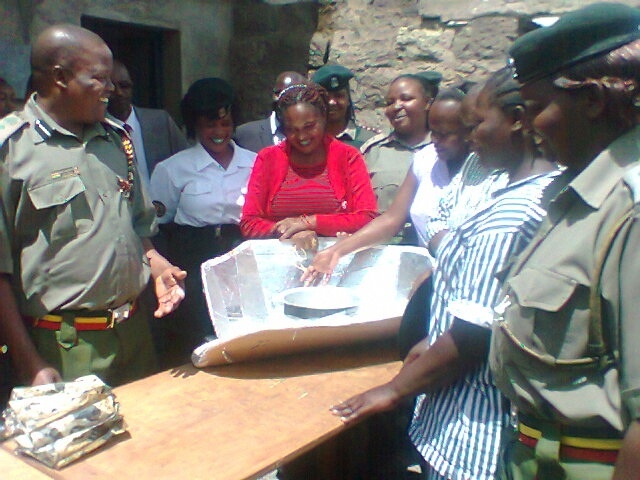 WASH Education, solar cooking, water testing and leadership development were among the other topics covered in their training. 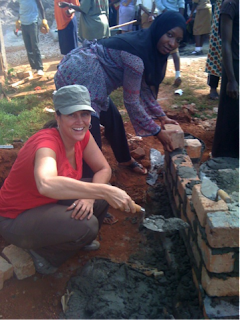 During the training program, Rachel and Grace learnt how to build various rainwater harvesting systems and a ferro-cement tank. A ferro-cement tank is made of cement, rebar, chicken wire and other locally available material. 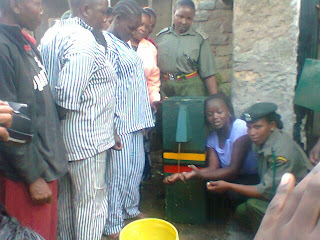 They believed that this skill would be useful for them and other members in the group to collect rainwater and store it. This will save the women from walking long distances to fetch water every day. As part of the GWWI Training program, each team selected to participate is encouraged and supported to build the technology they learnt. 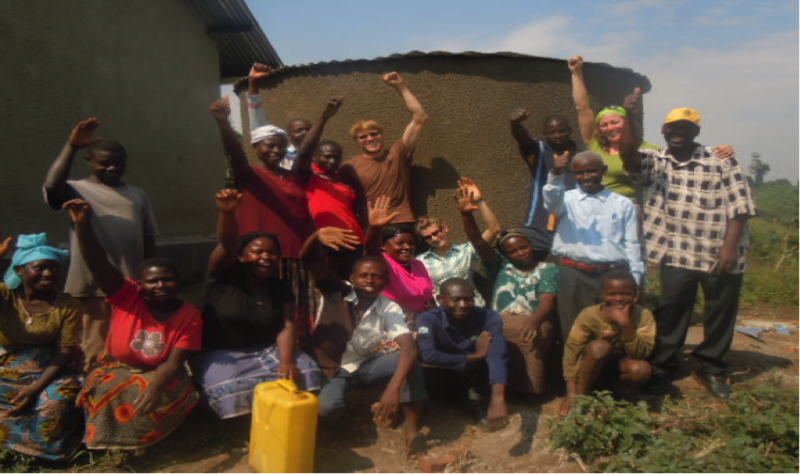 Rachel and Grace built their first roof catchment and ferro-cement tank with GWWI’s financial and technical support. GWWI provided a $1500 seed grant as well as on-site technology trainers and GWWI Fellows who came to the village of Kishange to help build BUWEAs first rainwater harvesting system. 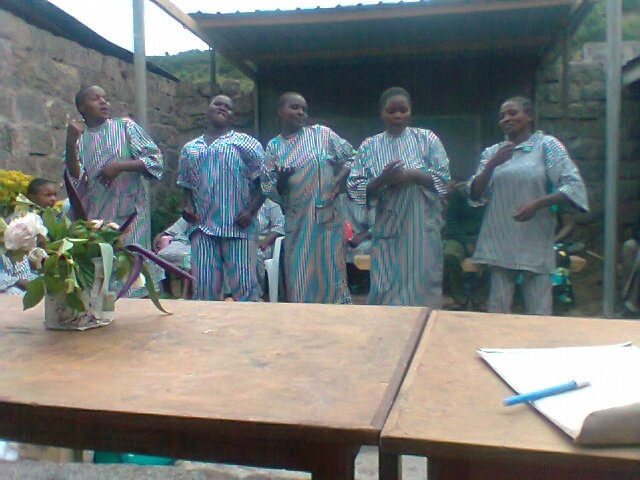 Their first course of action when Rachel and Grace returned home was to mobilize the BUWEA women, village leaders and volunteers. 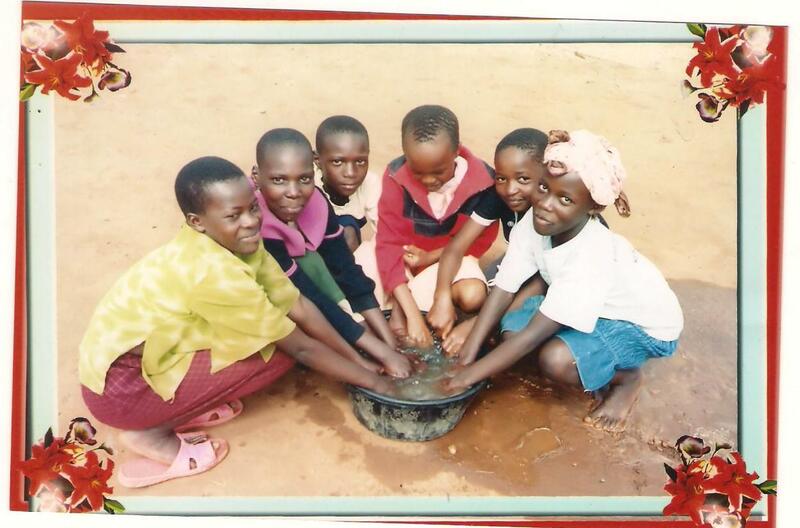 They offered do so peer education programs in Water, Sanitation and Hygiene. Despite the rain and family chores, the BUWEA women came everyday and often stayed past the time commitment knowing they had much to learn! They instantly got community support and selected sited to build their first rain harvesting system. To construct the second rainwater harvesting system and tank, BUWEA had to mobilize their own resources while the GWWI Team provided technical, planning and grant-writing support. 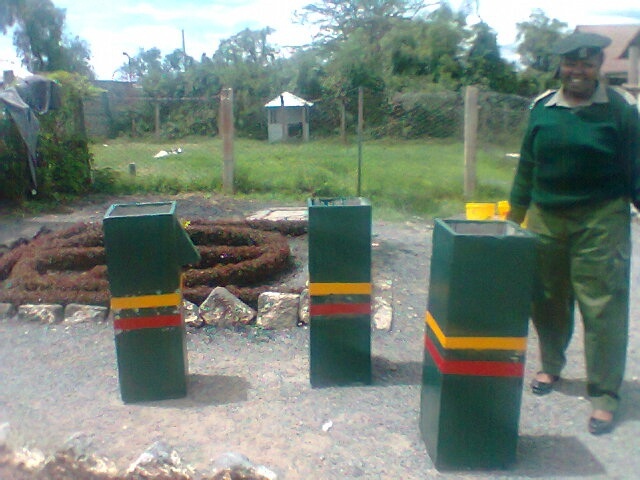 Within three months of building their first rainwater harvesting system, BUWEA was able to write a successful funding proposal to Women’s Global Connection and by January 2012, BUWEA women were able to build two more rainwater harvesting tanks, train more women and provide water for more families! BUWEA women were incredibly dedicated, grouping their resources for a common goal, sharing the benefits of their success, communicating and forming strong relationships with one another. Women from other BUWEA-supported communities who were not going to benefit from the actual tank came knowing that they would someday be able to implement this technology and share this knowledge in their villages. There is power in partnership! When I spent two months last summer as a fellow with the Global Women’s Water Initiative in Uganda, I hoped it would not be what a colleague termed as “drive by” international development. I have a MS in sustainable development, and nothing pains me more than to see Westerners create further dependency in the communities they are trying to help. I wasn’t sure how the “ripple effect “would play out. But as I sat in the conference room with this group of amazing women talking pee and poo, a subject matter that disgusts most people but excites this group, I thought to myself that the experience needed to play out further for me. I didn’t obsess about this too much. 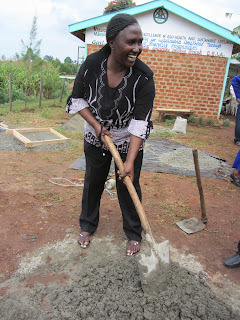 I had work to do- communities to bond with, women to support, latrines and water tanks to build. Back in July I wrote about how the Training in Kampala impacted me. Imagine spending 24/7 with 50 strangers for two weeks of learning, training, building, discussing prescribed topics, sharing our stories, eating, taking walks, having tea breaks, chatting, laughing, dancing, singing, taking shopping and beach excursions, and more dancing and singing. Wow, what an experience! I feel like I have 50 new friends. I have heard so many personal stories that have amazed and moved me—stories of resilience, strength, perseverance, tragedy, joy and accomplishment. What do we all have in common? Our ages range from 23 to 67. We come from 6 different countries. The truth is, we have bonded over poo, safe water, and hygiene. And female empowerment to make these things happen. When we started to build a VIP latrine, can you picture 12 women arguing over whose turn it is to saw wood and mix concrete? The enthusiasm and energy were amazing. But the challenges we faced are normal fare here. The most obvious are funding and lack of proper tools and quality materials. We used the equivalent of a nail file to cut through a metal rod. We used a machete to sculpt the wood hole that has curves. I was dreaming about powertools! For ease, for accuracy and to save time, but with inconsistent power, such tools are a distant dream. Adapting is key in these sorts of projects. You make do with what you have. All we accomplished was building the cement base of a latrine, but we felt we'd climbed Mt. Kilimanjaro. Me and my awesome new friends. It all boils down to the relationships one builds. I was one of two fellows who did not bring a computer with me. And though I begged the others to use theirs to check my email, I believe that not constantly being in touch with life back home allowed me to really experience being where I was. In the scheme of things, two months is really a short period of time. But in such a situation you somehow come to know people deeper in a shorter period of time. As I was preparing to leave after 2 months in Uganda, a couple of the other fellows and I were struggling to figure out just how these relationships would continue and thrive despite the distance. As fellows we were assigned teams to follow for a year to make sure progress was made implementing their water and sanitation technologies. We sincerely wanted to fulfill our promises, but we were not sure how. Back at home things at my job were going very well. Someone had replaced me for the two months I was away but I slipped back into my role as Operations Manager at the Global Soap Project with relative ease. I decided my first order of business was to raise money for more water tests for the community of Kitojo. We performed them with about 30 community members to see if their water sources were contaminated and, sad to say, many were. They asked me for more tests so they could share this valuable information with more members in their community. We discussed why contaminated water was harmful and ways we could mitigate the health risks. By October I had sent $750 to be spent on more tests. The tests would be purchased from a Kenyan woman who was also at the conference, Mama Solar, who distributes these tests. I was promised that the water testing kits would be accompanied by discussions on what to do if your water source is contaminated, empowering people with solutions. Then the founder of the nonprofit I work for, Derreck Kayongo, was named a top 10 CNN Hero for 2011. As a former refugee from Uganda, he noticed the waste from the gently used bars of soap from hotel stays. Knowing firsthand how many people could be positively impacted by access to this resource, he started partnering with a few Atlanta hotels to capture their discarded soap, clean it and form it into new bars. In the two years since its inception, Global Soap project has made over 100,000 bars that have been sent vulnerable populations including refugees, orphans, disaster victims and prisoners in eighteen countries worldwide. On relatively short notice CNN told Derreck they were hoping to film him distributing soap in Uganda. Lightbulb! One of the projects I worked on last summer was a VIP latrine being built in a Kampala slum with the guidance of local NGO partner UCOBAC. While there, I promised I would try and get soap for the handwashing station next to the toilet. This turned out to be the way. UCOBAC graciously agreed to assist and Derreck left for Uganda with just over a 1,000 bars of soap for the slum, school and women’s group UCOBAC works with. 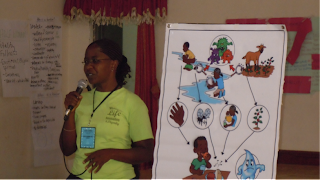 He discussed with each group the importance of handwashing and hygiene for good health. Another contact I met last summer who lives in Kenya and has an NGO has asked for 100,000 bars for schools, an orphanage and a female prison her group supports. This is the next project on my list. Jane and Lindah are powerful leaders in Kilili Self Help Project (KSHP), a community based organization in Kitale, Kenya. KSHP works with poor farmers in the Western North Rift of Kenya, teaching them the skills of biointensive farming methods. Implementing grass roots development work, they aim to improve food security, soil fertility and empower communities. View video . 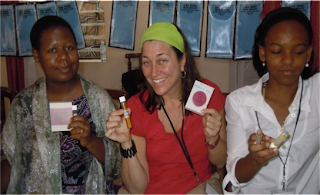 Jane and Lindah were sponsored by our friends at the American Jewish World Service, fighting hunger, disease and poverty in the developing world. Jane and Lindah knew that focusing on community health and wellness through Food Security needed to be supplemented by ensuring that families also had access to clean water. Although, their communities had water available, it was not always safe water. At the Global Women’s Water Initiative training in Kampala, Uganda in July 2011, they learned how to build the Biosand Filter (BSF), a simple household water treatment made out of local materials that removes up 90-100% of bacteria, parasites and viruses. 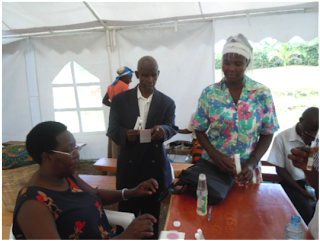 When they returned home, they tested their communities water using the Portable Microbiology Lab, a simple water testing method that identifies contaminated water. After discovering that many of their local water sources were not safe, they hosted a BSF training with GWWI training partner Connect Africa, inviting volunteers from many of the different villages where they work. 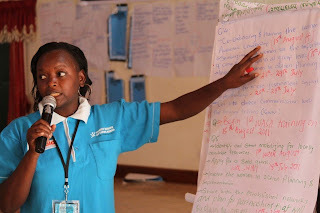 Training alongside Connect Africa solidified Jane and Lindah’s knowledge of the BSF as well as added a much needed service to KSHPs roster of sustainable technologies. Participants of the training making BSF water filters! Word spread like wildfire when the participants went home and shared the BSF as a solution for their water issues. Soon Jane and Lindah were being asked to train more people. 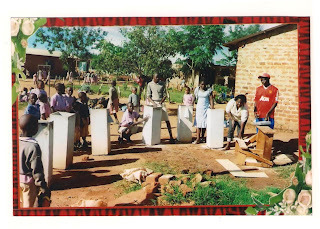 Parents of students at Angel Academy School in Kiminini where the typhoid rate was very high, raised money to host a training and build enough filters for over 500 students! The students even helped! They were also invited to share the BSF technology for the Agricultural Society of Kenya attended by the Ministry of Water and Irrigation. In addition, they helped local women start a micro-business through a waste management strategy making solar cookits as well as crocheted bags, mats, hats etc out of plastic bags they learned from GWWI Trainer Faustine Odaba! 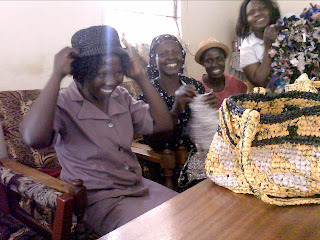 Ladies trying on hats and bags made of crocheted plastic bags. KSHP has trained over 116,000 families in Biointensive Farming! We have no doubt that they will be able to reach out to those families and more with clean water, waste management and micro-business strategies! Follow us on Twitter and like us on FB!